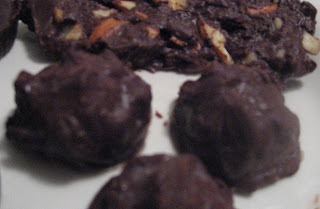 Google+ Rawfully Tempting™: I'm Having a "RAW"nchy Love Affair...With Chocolate!!! I'm Having a "RAW"nchy Love Affair...With Chocolate!!! Thank you Carmella from The Sunny Raw Kitchen! I recently purchased a bunch of supplies to make raw cacao treats and had no idea where to start. Her recipes and descriptions of each of the items helped so much, and gave me some great ideas to start with. You really have to play with these products and get a feel for them. Here is my raw foodie experiment. WARNING: It is messy and I learned a valuable lesson in PATIENCE with allowing enough time for one item to chill thoroughly, before attempting to melt cacao paste or butter. What a trip! I felt like a kindergartner with paste all over my fingers...only this was totally lickable! It would have made a great Kodak moment if I could have picked up the camera. Here's my attempt and changes to those wonderful Hazlenut Truffles, aka, "Ferrero Rawcher"
Note: I am not totally sure of all of the measurements, since I was adjusting the recipe as I went along, so have fun, experiment, lick (I mean taste), and experiment some more. Process the hazlenuts until clumpy and oily. Add the rest of the ingredients, except for water and mix. Add water until you reach desired consistency. Store in freezer to set. (Be patient and really let it set). Finely chop a handful of hazelnuts in a nut grinder or FP and set aside. (I sadly missed this step). Take a spoonful of chilled raw nutella and press a hazelnut into the center. Roll into a small ball (Wet palms and fingers help) and return to freezer to set. (I was impatient and missed this part too. No wonder I had such a hard time). While the hazelnut kreme is chillin' ...Melt the cacao paste. (Options: Place paste in a bowl over a pot of hot water and stir, or melt in dehydrator) I did cheat and put it in a double boiler on a really low heat and would remove from heat as it started to melt. Cacao paste does take much longer than coconut butter or cacao butter to melt. I need a little practice with this. When melted, stir in maple syrup, agave nectar and hazelnut extract. Mix until creamy by hand or place in high speed blender. (I did this by hand). When Hazelnut Kreme balls are set, dip each ball into the Hazelnut Chocolate Coating. Note: This mixture was pretty thick for me and didn't do "dip" so good. I had place a glob of it on a big spoon, and do a combined rolling and spreading the coating over the ball. Place on a cookie sheet covered with parchment or wax paper. Place in refrigerator or freezer to set. (If frozen, transfer to refrigerator and allow time for the hazelnut filling to soften). Mine came out really sloppy, but they were melt-in-your-mouth fabulous!!! !